Oh how I love making connections with Phoenix-area wedding vendors! I so love the bridal industry, and the many, many connections to be made. We've shined a spotlight on event planner Mrs. Celebrations, and boudoir photography expert Le Boudoir Studio. Today I have the absolute pleasure of shining the vendor spotlight on one of the most popular bridal gown shops in town, Brilliant Bridal! Grey. Boring I know, but I can't get enough of it. I love spider mums! They have great vibrant color and visual interest. What is your one "can't leave the house without" accessory? Chapstick. Living in Phoenix, you can never have enough. Who inspires you the most, both in life, and career? The particular person tends to changes through different seasons of life, but I'm always inspired by strong, successful women who can crack a good joke. I grew up with the classic I Love Lucy shows and right now I'm a big fan of anything Tina Fey does. The end of 30 Rock was devastating. How did you get your start in the wedding industry? 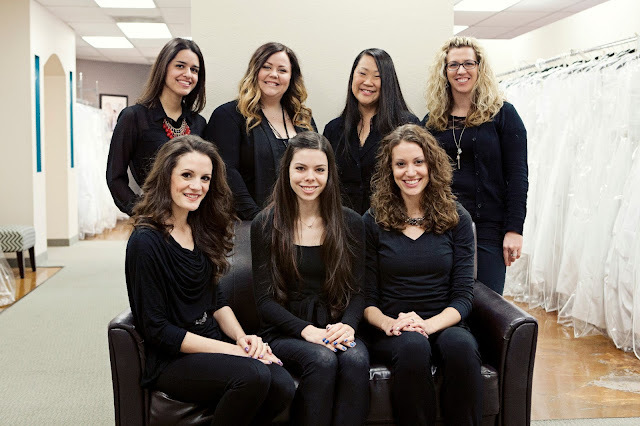 When did you know you wanted to operate a bridal gown boutique? I got my first job in the industry right after I got married in 2007 and wanted nothing to do with weddings any more! I worked for my good friend and photographer Kimberly Jarman as her studio manager and assisting at weddings. During that time I started an invitation design company that eventually drew me away from working with Kim and then eventually Brilliant Bridal drew me away from the invitations. It was really an evolution to where I am today. I never had any big grand plans to open a bridal boutique, but when the opportunity presented itself, it just felt right. Do you remember what it was like having your first client purchase a dress at Brilliant Bridal? Do you remember the dress she bought? I don't think I'll ever forget our first bride or the first dress. She came in to our store when the paint was stil drying on the walls and we were moving in dresses. I was covered in dust and wearing jeans and tried really hard to have her come back when everything was more professional, but she was determined to find something that day and she did! What sets Brilliant Bridal apart from other bridal gown boutiques in town? The "off-the-rack" concept has grown significantly just in the past two years since we've opened. But where I think we really shine is marrying the off-the-rack discounts and convenience with the boutique experience. We have a beautiful, bright and modern boutique and will tailor our level of service to your shopping preference. If you just want to browse on your own we are ok with that, but if you want the full service treatment and want our consultants to pull dresses for you, we will go to work! What can clients come to expect from their experience at your boutique? In addition to a huge selection of designer wedding dresses, we really focus on treating our brides like family. We have chosen not to pay our consultants on a strictly commission basis, like most bridal stores, because we want all of our brides to receive the same level of service, regardless of budget. Our focus is not on getting a sale, it's on helping brides find the perfect wedding dress for their big day. That shift in our focus creates a much more enjoyable and stress free experience for our brides. How is your boutique able to offer the dresses you carry at such amazing prices? Our bridal gowns are overstock or discontinued styles. We purchase them in discounted large bulk purchases which allows us to pass the savings on to our brides. Is there a designer that is a client favorite? Do you have a favorite? Brides are always asking for Maggie Sottero gowns. We love Maggies and always get excited when we receive them in a shipment. But I think for us right now, we really love Alfred Angelo and Allure. Their dresses are such an incredible value for your dollar. They are well made with good construction and high quality fabrics, we always feel really good about a bride walking out of our store with one of those designers in hand. What advice do you give brides when it comes to selecting their wedding gown? Have an open mind and work with an expert. I can't tell you the number of times a bride walks in saying she doesn't ever want to wear a big ball gown dress, and then a couple hours later walks out with the poofiest, blingyest, princess bridal gown you have ever seen. Our consultants work with hundreds of brides a month and really are experts in helping you find the perfect wedding dress. Will you be attending any of the upcoming bridal expos through the remainder of 2013? Yes! We just wrapped up the January Arizona Bridal Show which is always a lot of fun and we will be attending the June show as well. In addition we host "Vendor Parties" at our store about 4 times a year which are like a mini bridal show. There is more info about our Vendor Parties on our blog. Our many thanks to Melanie at Brilliant Bridal for sharing a little bit about yourself, and your business with us! How I wish I was your client when I married 4 years ago! You carry some gorgeous gowns, and it's no wonder why brides flock to your shop. 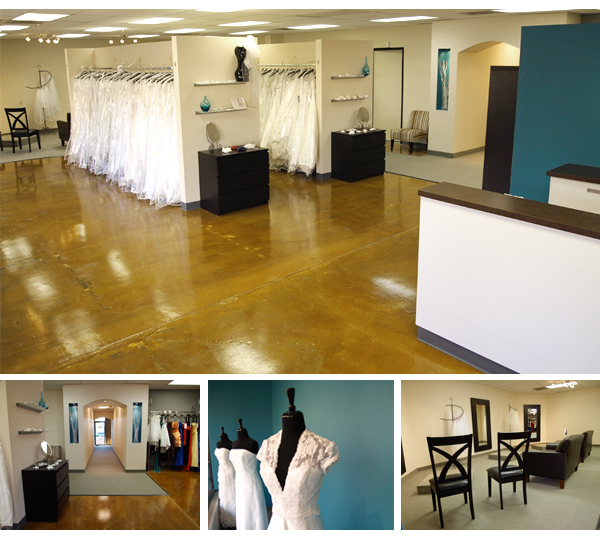 If you're in the Phoenix area, please stop in and visit Melanie and her team to find your perfect wedding dress. You'll be glad you did! Always great to 'meet' a professional in the wedding industry and learn their 'back story'! Thanks so much for allowing me to share about what we're doing here at Brilliant Bridal, Kristen!